Lewis Rice is pleased to announce that member Emily K. Bardon was selected for FOCUS St. Louis'® Fall 2018 cohort of Emerging Leaders. The FOCUS Emerging Leaders program has trained hundreds of young professionals since its launch in 2012. Through the competitive program, the class of 31 young professionals will increase their engagement in the region and cultivate tools to develop as the next generation of St. Louis regional leaders. To learn more about the program and the Fall Class of 2018, click under "Resources" below. Emily represents both publicly and privately held companies across several industries, including food and beverage, entertainment, energy, technology and manufacturing. She works closely with clients on corporate and transactional matters ranging from mergers and acquisitions to the negotiation and drafting of various commercial contracts, and she is experienced in advising state and nationally certified women-owned businesses. 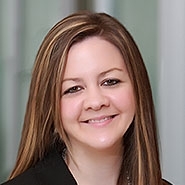 In addition to her corporate work, Emily represents underwriters and issuers in connection with municipal bond financings both within and outside the state of Missouri.